A massive thanks must go to the dozens of lovely people who found time to come along to what was a big, BIG day for the food forest last Sunday! We were very excited about welcoming lots of new friends from the Permablitz collective to help us finish this bit of the food forest rejuvenation project with a bang and we had an amazing day. 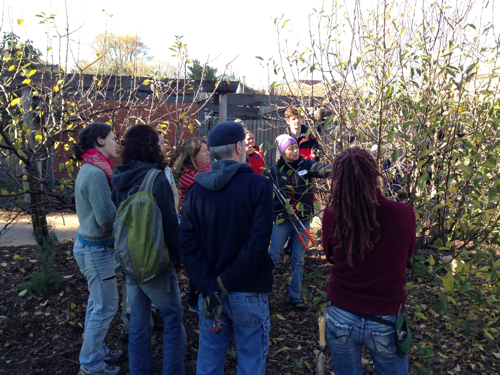 Despite the chilly start, we literally got MONTHS of work done in one day with lots of us learning about composting, pruning fruit trees, mulching, planting and weeding (as well as getting in plenty of practice), chatting with each other and eating the yummy food. A special mention for the people who put together the feast and to the diligent diggers who toiled for hours to completely remove a pesky rose that's been coming to haunt us back despite all out efforts to date. By the close of a long day, the food forest looked loved and refreshed and there were many smiles on tired faces as we packed up and made our way home. In the days since, we've seen quite a few "what an awesome day!" messages too. 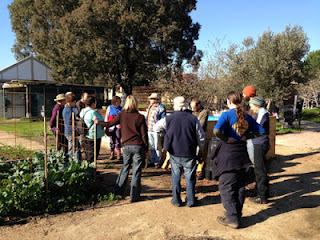 The community garden and food forest at Dunstan Reserve provide a great place to connect and hang out as well as to learn about and participate in growing food together and it's being run by and for people from the local community. Days like last Sunday are what this place is really all about. If you came along on the day and took any photos, we'd love you to share them either by sending us at grow.eat.moreland@gmail.com copies or by uploading them to our flickr group. Now we've delivered on this first phase of rebuilding the food forest, it's time to establish a "friends of" group to take on the role of custodians of the food forest, to take care of it, plan for its future, keep it alive and growing. We'd like to invite everyone who's interested in hearing about this and/or being part of the group to come along to the community garden on Sunday 21st July at 11am to have a cuppa and help plan the next steps.